Shavuot, one of the three pilgrimage festivals, is mentioned in the Torah by various names in five places. [Exodus 23 and 34, Leviticus 23, Numbers 28 and Deuteronomy 16] The main thrust of the holiday is the ability to utilize wheat that has taken root prior to Passover and is cut down after the 16th of Nissan for communal sacrificial purposes as a meal offering. The ability to use this wheat, normally called Chadash, occurs when part of that wheat, which the Torah calls Mincha Chadasha or Bikurim, is taken to the Temple and waved in combination with portions of the animal sacrifices. The ability to use Chadash, whether wheat or barley, by individuals occurs immediately after the 16th of Nisan when the Omer or Barley sacrifices were offered. This is not dependent on the festival of Shavuot. What is unusual about this communal meal offering called The Two Loaves [Shtei Ha Lechem] is that it is mixed with a leavening agent while all regular communal meal offerings must remain unleavened or Matza. There is no mitzvah that is associated with Shavuot which must be performed by individuals as is so in the case with the festivals of Pesach and Succot. On Pesach there are the mitzvot of eating the Paschal Sacrifice, the Matzah and Maror and the recitation of the Haggadah. On Succot an individual is obligated to live in a Succah and take hold and wave the Four Species. There are no similar obligations on Shavuot. This may be the reason why in the Rabbinic tradition Shavuot is called “Atzeret,” which is the end of the Passover grain season. This is similar to the Torah’s reference to the last of day of Succot which is seen as a separate holiday called Shmini Atzeret, which also has no mitzvah of its own. The main reason for which Shavuot is known in our tradition and which is stated in our prayers is that it was the occasion on which Israel received the Torah at Sinai. It is thus called Z’man Matan Torahteinu, i.e. the time on which the Torah was given to us. It is ironic that this major aspect of Shavuot is precisely the one element which is obfuscated in the Torah. With all the other festivals and religious observances the Torah specifically states the month and supplies the date of that month for the observance. Here this is absent. The Talmud maintains that the Torah implies that the Torah was given on the Fiftieth day after the 49 days of the counting of the Omer. Even in this instance there is a controversy in the Talmud between the rabbis and Rabbi Yose whether that 50th day occurs on the 6th or the 7th day of the month of Sivan. [ Shabbat 86b ] This entire incident is shrouded in mystery. What is troubling is that following this awesome Revelation there is a continuous theme throughout the Torah and the books of the Prophets which warn against the worship of idolatry which was a frequent occurrence in Israel. Indeed, our Tradition maintains that the destruction of the First Temple was primarily due to idol worship on the part of the people of Israel. Why was not the direct revelation of God sufficient to avoid such a failure of our people? The Rabbis are indeed very troubled by this question. Various opinions evolved to answer it. The Ramban maintained that Israel heard all of the ten commandments in their entirety. They were heard, however, in an atmosphere of great fear and anxiety. Israel attempted to run away as far as possible from the boundary which Moshe had established around Mount Sinai. Moshe attempted to coax them into remaining steadfast, but he could not allay their fear and they remained far removed throughout the revelation. Exodus 20:16. In addition, the Ramban cites the Rambam in the Moreh Hanevuchim II:33 where the Rambam maintains that Israel only heard the first commandment. 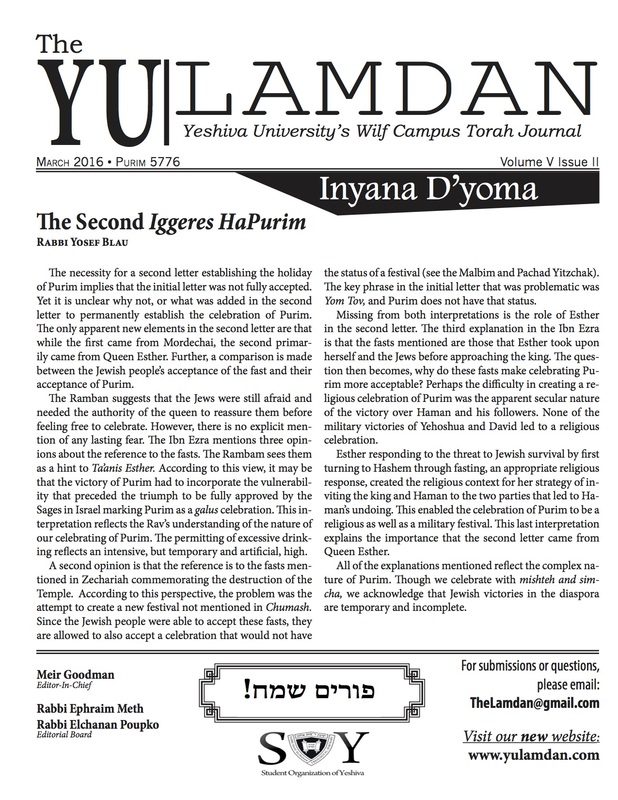 The Rambam questioned why the Targum Onkelus used the passive tense of the word “to speak” rather than the active tense in God’s statement to Israel. The Rambam answers that it is to indicate that the understanding of Moshe of the revelation was far superior than that of Israel. Finally, the Ramban states that the according to the opinion of the Targum Onkelus, Israel never heard the word of God directly, but only through the voice of the fire. It was only through the fire, “that they heard what they heard, and they understood what they understood.” Ibid. The Rambam strongly disagreed with the Ramban’s interpretation and indeed differed from his own position in the Moreh Hanevuchim in the understanding of the Revelation. He maintained that Judaism as a religion was radically different from all other religions precisely because it is based on the personal experience which the Israelites had with God and which they saw with their own eyes and heard with their own ears rather than from the words or testimony of witnesses. “For the prophesy of our teacher Moshe is not based on any sign or miracle rather we saw it with our own eyes and heard it with our own ears exactly as he [Moshe] heard it. [M.T. Yesodai Ha Torah 8:3 ] If this is true, then all of Israel had the ability to have a direct communication with God unmediated by the senses and would, like Moshe, be comparable to the ministering angels [Malachei Hasharet]. Ibid. 7:6. If this is true then the problem of continuous idol worship by the Israelites would be much greater to the Rambam than it would be to the Ramban. We are thus faced by an insoluble conundrum. If the Ramban was correct about the Revelation then what was the nature of its uniqueness and significance and why was it at all necessary? In essence it would not be different than other mediated Revelations which allowed a Bilam to remain Bilam. If the Rambam is correct then the problem is even more insurmountable. After experiencing God directly, how could Israel even entertain the notion of Idol worship? We can only conclude that the experience at Sinai was only the beginning of the process and it would take centuries before the desire for idolatry could be eliminated from the Jewish consciousness as is indicated in the Talmud. Perhaps it is for this reason that the Torah cloaks the Giving of the Torah from the festival of Shavuot. An interesting way to deal with this conundrum is to utilize a seminal idea in western thought which was expressed both in antiquity and in modern times. This idea expresses the notion that there is a profound distinction between a direct experience and the recollection of that experience later in time. Ironically, the depth of meaning of the experience is much better understood in the recollection of it rather than its immediate revelation. When one encounters the immediacy of an event, he is overwhelmingly bombarded by sensations and emotions which renders that experience impossible to truly understand. It is only at a later point when the mind recollects an event or experience does it have the luxury of the various elements of thought and interpretation which is crucial to the understanding of the experience itself. Thus, it was only after Israel was removed from the immediate experience of the Revelation that they slowly began to realize what it meant to encounter God and why Moshe, who understood God immediately, was unique among men and their greatest prophet. This realization that the Jewish God is the only true God, which is expressed in the Ten Commandments, is what set them apart from all other nations. May this always be the case.